High Standards–A Unifying Cause for Transit Advocates? Yonah Freemark over at The Transport Politic has been writing a lot recently on the need for higher-quality transit infrastructure and services. His most recent post is called “A Call for Minimum Service Standards,” and while the post itself is very good–analyzing the tendency of American transit agencies and cities to invest in very expensive new transit infrastructure but provide it with subpar service–it was his use of the word “standards” that got me thinking about a topic on which I’ve been meaning to write. At times the debate between different sides of the transit world can seem completely out of control–like transit advocates are strangling themselves in the same way most leftist movements (not that all transit advocates are lefties by any means, but most are) have done–by allowing their movement to fall apart in a cascade of hairsplitting and mutual recrimination. Mixed-traffic streetcars seem to be generally the biggest flashpoint, provoking strong feelings on both sides of the proverbial aisle. Is there, in fact, anything that holds “the transit world” together as an entity? For me, there still is. I don’t want to co-opt anyone’s language or try to speak for any of the people whose work I’ve linked to here, but it seems to me that the common thread here is that everyone wants to hold American transit to high standards. What the most important part of those standards is may (and does) differ from person to person and sub-community to sub-community, but there’s a consensus that America has just not taken transit seriously, and now it’s time to do so. That consensus, whether people realize it or not (and I think most do) is driven by the historical experience of the last 60 years–decades that transit, the red-headed stepchild of the American infrastructure family, has spent begging for table scraps. Transit funding, infrastructure, and operations have been a political football, used and abused by politicians at all levels of government with little concern for the day-to-day, year-to-year viability of operations and infrastructure. For most transit advocates today, with the revival of many of our cities, increasing concern for the environment, and the rise of a class of American citizens who genuinely don’t want to own or use automobiles any more than is necessary, the desire for transit isn’t nostalgic, and it’s not based on thinking of transit as a social or welfare service, fit only for the few citizens who lack the means to use cars. We don’t want transit to be thought of as a basic service provided to the desperate, and we don’t want its primary political value to be as a photo op for glory-seeking politicians–we want it to work, and work well. And sadly, there’s a crying need for transit to be held to those kinds of standards. There’s no doubt that American transit, both intra- and inter-city, is well behind Europe, Japan, and even China and a few other places on many technical grounds. We need to build and operate the same kind of transit other countries have done for decades. And yet, in transit as in other sectors of governance, technical innovations matter little–and can even be a recipe for waste–if the political class is acting in bad faith. We don’t need to get over our differences of opinion, but we do need to build a political movement that is capable of forcing politicians to take transit seriously and hold it to high standards technically, fiscally, and yes, experientially. When Yonah uses the phrase “A Call for Minimum Standards,” he’s not actually looking for minimum standards. He is, ultimately, asking American politicians, transit agencies, and advocates to hold themselves to the same high standards as do their counterparts worldwide. Can We Really Blame ADA For High Transit Costs? Via Bacon’s Rebellion, we find this article from William Lind at The American Conservative Center for Public Transportation. The basic argument is that Andres Duany’s principles of “Lean Urbanism” can be applied to thinking about public transit as well as urban design and architecture, and that excessive government regulation is holding back the efficiency and cost-effectiveness of America’s public transit systems. As a longtime reader of Alon Levy, Stephen Smith, and the like, I’m quite sympathetic to this view despite (or, I would argue, because of) my own progressive views. Sadly, though, Lind doesn’t examine the writing that’s built up on this topic, which may just lead him into an intellectual trap. Here we begin to see a tie-in with transit. ADA has proven the single most expensive, least useful mandate ever leveled on public transit. Serving a small number of disabled people takes a large chunk of transit systems’ budgets, both capital and operating. Many of the special facilities ADA demands of transit systems are seldom if ever used. If something intended to serve the disabled is frequently used, including by people who are not disabled but nonetheless find it helpful, I’m all for it. But millions have been spent entirely uselessly. Aside from Lind’s seemingly coldhearted attitude toward the mobility needs of the disabled, are ADA requirements really a key driver of excessive costs in the transit world? Let’s review the work of the writers who I already complained about Lind not citing. The problem is that most agencies now have little in-house talent, so they may not know if their consultants are doing a good job or not. This is true from the bottom, where agency engineering positions pay less than outside consulting and consequently make it difficult to retain talented people, to the middle, where agency PMs are likewise paid too little, to the top, where some agencies are run by political appointees who don’t know enough about transportation. Consultants Checking Consultants Checking. . . This is a biggie. The incentives presented to consultants don’t always correspond to the best interests of the contracting agency or the public trust. There’s a lot of collusion between consulting firms and a lot of hopping back and forth between private-sector firms and their public sector employers. It all adds up to a lot of grey areas…at best. Government can get sued, so can consultants it hires. Sometimes public agencies demand exorbitant things in order for another agency to be able to use their territory. Different departments within agencies make sketchy shifting-around of resources easier. We spend lots of money to preempt lawsuits. Sensing a theme? We spend more than other countries do on making sure people’s lives change around transit projects as little as possible. Primarily refers to this Pedestrian Observations post. Politicians like to add on all kinds of ancillary things to transit projects. That’s right…I don’t see ADA there anywhere. Nor do the costs of ADA compliance show up in Stephen J. Smith’s definitive series on the topic. ADA elevators (required in all new subway and elevated train stations) are expensive, but in the general constellation of waste and excess that characterizes American transportation capital and infrastructure projects ADA costs would seem to be small fry. Turning to operating costs, however, we find that Lind may have a point after all. The woes of paratransit services, the flexibly-scheduled, door-to-door operations that ADA requires transit agencies to operate in order to serve disabled people within their service areas, are well-documented. Paratransit is both hard to use for the consumer, generally requiring scheduling well in advance, and massively expensive for the transit agency. A 2008 Transportation Review Board report found that “Although paratransit ridership is still a small portion of the whole, slightly more than 1%, in 2004, paratransit comprised 9% of transit operating costs (Public Transportation Fact Book 2006). The operating cost per trip for paratransit service was $22.14; for all other modes, the operating cost per trip was $2.75 (per trip costs calculated from APTA data).” In some cities, paratransit trips can cost the agency up to $30 per ride. And while agencies charge slightly higher fares for paratransit, the fares fall even farther short of covering operating costs than typical transit fares (say, by a factor of 10). Paratransit, of course, is at the core a societal, ethical dilemma rather than an economic one. Simply put, enabling mobility for disabled people is an expensive proposition. When that means folding certain requirements into the cost of infrastructure projects, the cost is minimal relative to other expenses, and thus ADA infrastructure requirements probably shouldn’t be controversial. Paratransit, though, is a much more complicated question. When a transit agency has to spend nearly a tenth of its budget on only 1% of its passengers, serving those passengers takes away from the agency’s ability to serve other passengers, including those who have non-mobility-related disabilities. It’s a situation where two “progressive” goals–mobility for the disabled and giving population-wide transportation options–have been put fundamentally at conflict by well-meaning liberal policies. Here, then, Lind has done well to expose an unintended consequences of government regulation. The question of what to do about the situation (which is of little interest to Lind–he’d presumably just cut ADA paratransit requirements), though, remains unresolved. I’d suggest that it’s high time for budgetary responsibility for paratransit to be transferred from transit agencies to another division of government (health?) Transit agencies could continue to operate the services on contract. That might not cut down on waste overall, but it would likely allow transit agencies to allocate their own resources more efficiently. Then again, I know little about paratransit budgeting, and I’d be happy for someone who knows more to enlighten me. But back to Lind. He holds up ADA as a primary example of the waste induced by overzealous government regulation of transportation, both in capital and operating budgets. ADA paratransit requirements are certainly very expensive, but that waste isn’t a product of inefficiency per se; rather, it’s a product of a conflict of societal values. And it’s worth remembering that when it comes to infrastructure costs, ADA shows up nowhere in actual analysis of why American transit projects are so expensive. It seems that, while hitting (almost unintentionally) a few truths, Lind chose a primarily symbolic target for his wrath about inefficiency, a canard that stood in the way of deeper analysis. Why is Lind so interested in targeting ADA? Perhaps the primacy of the failures of the private contracting process among actual explanations of excessive transit costs makes deeper analysis too uncomfortable for Lind and other conservatives to confront. Admitting that pushing most of the design-and-build process from the public to the private sector is in fact wasteful rather than efficient goes against everything that American conservatism tends to stand for in 2014. It’s an empirical illustration of the failures of private markets and privatization of government functions to provide what government can do more efficiently. That’s not to say that market- or efficiency- minded reforms have no role in transportation policy. Indeed, the tragedy of a piece like Lind’s is that there are many, many such reforms that are needed, but he chooses to spend some of his time in an attack on ADA that seriously lacks nuance rather than confronting his own movement’s partial culpability in skyrocketing costs. We need quality conservative voices in the movement for progressive transportation policy, in no small part because there are many liberal policies that have proven to have more problems than answers. But if conservatives are going to engage in lecturing liberals about self-awareness and introspection, then they’d better prove that they’re capable of those things too. A couple of weeks ago, following a series of bureaucratic screwups that nicely illustrated why the American medical system is so inefficient, and a monthslong period of coping with my own fear of needles, I had occasion to visit UAlbany’s medical center for the first time, to get a vaccine. Given that I am part of a two-partner, one-car household, with both of us working this summer, just getting there was harder than it would seem to be. That’s four lanes of traffic with a nominal speed limit of 40 mph (but designed for much higher, so of course everyone speeds). The rest of the area is bisected by highways as well, with motorized travel being truly the only safe way to move around, as can be seen in the graphic below, which highlights the route shuttles and other motorized traffic takes between Collins Circle (the center of campus) and the health center (click to embiggen). Well, you might say, Washington Avenue is a big street. 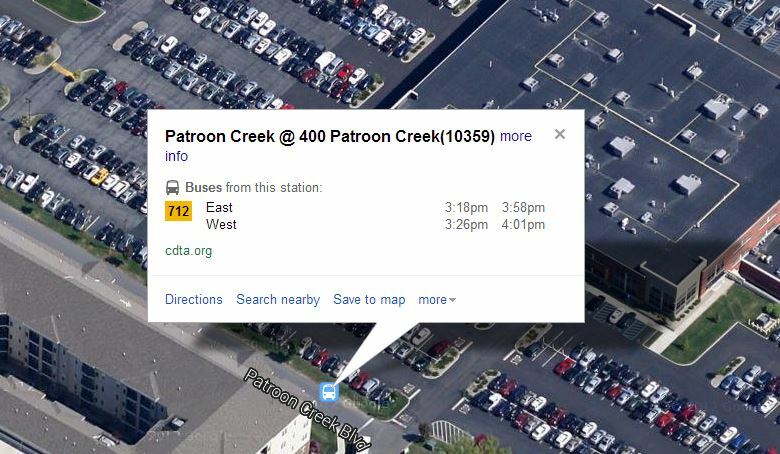 There must be a bus route on it that serves the Patroon Creek office park? And indeed, CDTA’s #12, one of its most frequent routes, runs down Washington. But there’s no stop for Patroon Creek. The two nearest stops are at Fairfield Inn and Brevator Street, each separated from the Patroon Creek complex by a depressed multilane highway. And why no stop directly on Washington for the complex itself? I imagine it has to do with the fact that the office complex is cut off even from Washington by a multilane frontage road that accommodates high-speed traffic and would be completely unsafe for pedestrians to cross. But wait! 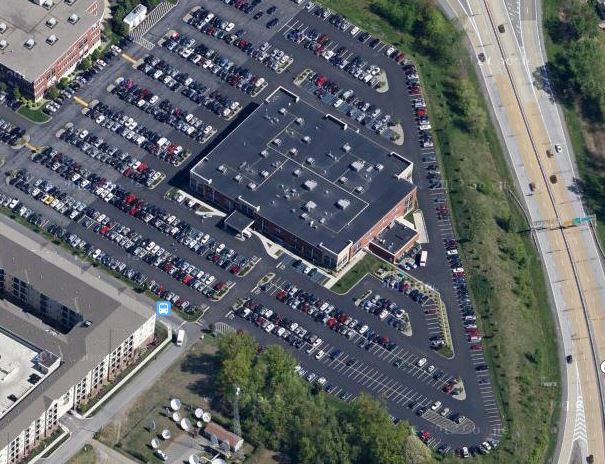 If you zoom in far enough, you can see a little bus-stop symbol on Google Maps, right next to the health center! In honor of that truly impressive deviation, I offer one of my own, a brief take on transit and the Harriman Campus: that’s about as bad as it gets. The Collins Circle loop is necessitated by CDTA’s student-focused ridership, but the rest of the loop-de-loop is purely a product of just about the worst “urban” design and land-use policies imaginable. Again, this is the ONLY bus route directly serving a state office campus that’s home to at least 7,000 employees. And what’s worse? No one can blame CDTA for this paucity of service–there’s simply no realistic way to do it with the current arrangement of frontage roads, highways, and overpasses. And remember–this land is all within the limits of the city of Albany. 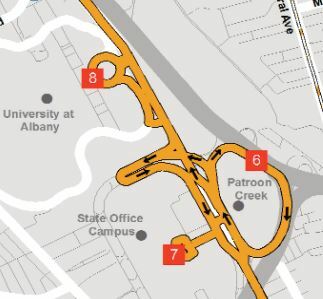 Change is coming with the planned Purple Line BRT-lite service, which will include a busway through the western half of the Harriman Campus and the UAlbany campus, but for now…just what a dreadful exhibition of auto-dependent land dynamics. How did I get there, eventually? I left work early, took a bus from downtown to Collins Circle, and then my partner G (who had also left work early) picked me up and drove me to the health center. Because there’s not really any other way.